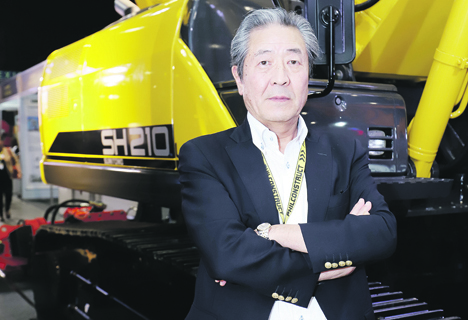 Sumitomo Construction Machinery Co., Ltd. considers itself a latecomer in the Philippine construction industry. Johnny-come-lately on a mission. Sumitomo managing director Ichiro Shimada admits that “we haven’t been here a long time.” But with President Rodrigo Duterte’s “Build, Build, Build” infrastructure thrust, he believes there is a rising need for construction machineries and supplies in the country. “The future is bright for the infrastructure industry not only here in the Philippines, but globally,” he declared. But Sumitomo managing director Ichiro Shimada believes that with proper market positioning, the Japanese global player will seize opportunities presented by the growing Philippine construction industry. Shimada admits they are latecomers in the Philippine market, and while they grow progressively “step by step,” they have many things to learn yet. Sumitomo is focusing on two products—the excavator and the asphalt-paving machine. Shimada feels confident his company has an advantage with this equipment as the company has focused inordinate resources to develop them. Sumitomo featured its fuel-efficient hydraulic excavators, the SH130-6 and SH210-6 and asphalt-paving machines, at the recent Philconstruct Manila Expo 2018 at the World Trade Center Manila. Shimada explained that Sumitomo excavators offer not just comfort and convenience, but high efficiency in terms of operating costs. “You don’t have to put so much money to maintain the machine. Everybody desires equipment quality and cost efficiency, particularly in construction work,” he pointed out. The Philippine market, Shimada, believes, is a highly viable one, but said there are many things that still need to be done, particularly in the field of infrastructure improvement. He noted that with the Duterte administration’s “Build, Build, Build Program” there is a rising need for construction machineries and supplies in the country. “The future is bright for the infrastructure industry not only here in the Philippines, but globally. The use of artificial intelligence in buildings and infrastructure is on the rise,” he said. “Take a look at the advanced countries like Japan, Europe, America. In these countries, there is now what is called a machine-controlled system which is becoming more popular. It assists machine operators who may not even be highly skilled,” he explained. “It has become difficult to find skilled operators for the construction industry,” he said. He cited Japan, which is facing a shortage of laborers. “This will be an area where all players need to develop responsive systems to provide more efficient work process. We’re gearing for less human control systems,” he noted. The Sumitomo executive shared that in the United States, they have just started marketing computer-operated excavators. “Once you set it—or if you have a three-dimensional drawing into the machine— the machine can operate automatically. That’s going to be one of the features in the future,” he predicted.